It might seem very strange but I have never put my solo name on a music production. It's even stranger given the current climate whereby DJs have to produce to get gigs. I have been part of many different production outfits such as 2020Soundsystem, 2020Vision, Chuggles, Otaku, Wulf n Bear etc but never used my name to produce. Somehow I have managed to survive as a DJ for nearly 25 years without having tracks out under my DJ name. I don't think there is anything wrong in using parts or vocals from other musicians and incorporating them into your own productions but I do feel you need to be the one behind the actual song and final mix to warrant your moniker on the record. After 2020Soundsystem finished this year I have been motivated to go down into my basement studio, which has been used primarily as a DJ room and start pushing my own production skills. It then made sense that the first track I would give my name to was created by an important studio mentor for me and former member of the 202Soundsystem Danny 'Dubble D' Ward, while the bass was played by fellow member Fernando Pulichino. It just felt like a natural progression after the band stopped. It has also made me think about the roles of DJ/Producers further. The topic has been in discussion recently in a few articles I have read, most concerning the rise of DJ Ben UFO. Ben is not a producer but the label head of Hessle Audio records. He is a true selector, finding music from many diverse genres to create a very interesting contemporary mix of music. All features on him have concentrated on the fact that he doesn't produce as a important moment in the modern electronic music scene but what is the history of the DJ entering production and how have we got to the current situation whereby, in general, DJs have to produce to get live work? "I just stopped (going out)...basically I didn't have no childhood. No girlfriends, no basketball, no hanging out, straight to my room...I got to figure this out." The amount of work required to learn each skill is huge. So is it a case of people being forced into being the jack of all trades but master of none? Would dance music be in a healthier state if the DJs played and the producers produced? Even the day to day lifestyle is different. Producers don't need to collect large quantities of other people's music, they concentrate on making their own or making music for other people. I always greatly respected my production partner Carl Finlow's steadfast refusal to own a single record. He never even attempted to pick up the decks. He is just happy behind the controls of a synth, DAW or mixing board. In much the same way I thought it an imposition to even attempt to learn keyboards. I was never in a million years going to play them as well as Carl so why bother? I had to practice my own chops on the decks. When I became part of a band, 2020Soundsystem, where everyone had their role and performed them well I also stuck to what I did best, which was play the beats. However, everyone has their own taste in music and at some point it is great to see what is inside you. Through all these years of working with other people in studios I found I had picked up much more than I realised. Technical skills can be learnt. They just take time. Somewhat late to the game perhaps but by now I must have racked up close to the 10,000 hours Malcolm Gladwell believes is necessary to become a master of your trade. It would only take me about another 20 years to do the same in a studio! "No one beat matched better than Richie Kaczor (resident at Studio 54)...he was the best at it, even with live drums wavering in beat Richie would ride the mix." "There was no way I could have extended the record by looping it back to the beginning. It would have sounded horrible . So at the end of the record I took out the strings, horn and guitar and I brought up the congas and bass. I let the groove run and then took it back to the original..."
Moulton had created an edit and extended version. Two of the most fundamentally important production techniques used by DJs today. His final contribution is well documented as the creator of the first remix. Not a bad legacy to leave. In the same year two DJs from very different backgrounds and scenes in New York, Kool DJ Herc and Walter Gibbons, started to extend the breaks in records by using two copies of the same disc. "Well the break thing happened because I was seeing everyone on the sidelines waiting for particular breaks in records...I said let me put a couple of these records together, that got breaks in them. I did it. boom bom-bom-bom...place went berserk. Loved it." "(Gibbons) technique of taking two records and working them back and forth in order to extend the drum breaks...earned him the reputation of being a highly skilled original." Kool DJ Herc is now widely credited as the first hip hop DJ and originator of break beat mixing while Gibbons is regarded as a true disco music legend. What they had both independently achieved was creating the use of the loop in dance music-the single most important production tool for making hip hop, house, techno, dubstep, drum and bass etc. George Martin had previously experimented with loops for producing The Beatles in the 60s and Delia Derbyshire must be credited with pioneering the use of tape loops for creating electronic music for the BBC Radiophonic Workshop but Herc and Gibbons arrived at looping sections of dance music to make people dance. Over in Jamaica the DJ had a very different role in 'nicing up the dance'. The DJ in Jamaica began life as the master of ceremonies or MC. The selectors or soundsystem owners played the records while the DJ injected energy into the proceedings through chat and chants over instrumental sections. Although the links between disco and dance music have been widely acknowledged, far less credit has been given to the soundsystems of Jamaica as both the precursors of raves as well as dub being responsible for many of the most important studio techniques used in producing the music. Dance music also started much earlier in Jamaica with the first soundsystems dating back to the 1950s and in full swing by the mid 1960s. The story is brilliantly told by Michael E. Veal in his definitive book 'Dub'. The big three were Sir Coxsone's Downbeat (Clement Dodd), Trojan (Duke Reid) and Giant (Vincent Edwards) . The soundsystem's themselves were as important as the selectors. They were built and maintained by the outfit and used the skills of technicians to deliver tens of thousands of watts of power. The music was delivered closer to Mancuso's philosophy of letting each track do the talking, while the actual talking was done by the DJ. The first Djs were Count Machuki and King Stitt at Coxsone's and most famously the groundbreaking U-Roy at King Tubby's. And it is King Tubby who must now enter the story. King Tubby was an electronics wizard who could build not only the components but also the transformers required to generate his legendary Hometown Hi-Fi soundsystem. He would play the records at the dances on a system built by himself but brought in U-Roy to DJ, who would do the job of whipping up the crowd. With shouts of 'haul up!' or 'come again selector' the DJ would let Tubby know when the jam needed to be started again to increase the energy for the dancers. "I start playin' - that time you have two players . I put on 'On The Beach' (and said) I'm gonna turn this place into a studio...I switch from the singing part to the (instrumental) version...cut the sound down...and everybody was singing." Bunny Lee and King Tubby happened to be at the studio when the version was cut and Bunny Lee also went to the dance and witnessed the reaction of the crowd. 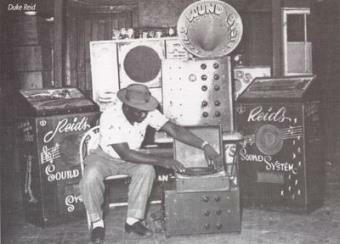 Redwood continued to create versions for his dances but it was Tubby's rapid take up of the discovery, encouraged by Bunny Lee, that led to his truly prolific and revolutionary output that largely defines dub music. All in all we have so much of the beginnings of the DJ/Producer crossover right here. We have a selector or DJ (Redwood) going to create a version of a production. He then uses the new version for what we now call Deejaying, note that he used two decks. A producer (King Tubby) then takes the idea of versions and adds many of the production techniques we still use today - delay, reverb and pitch shifting to create dub music. Yet he also 'plays' his productions at his dances. He has become a DJ/Producer as far back as 1969. What was also interesting to me was that Tubby didn't write music during that period. All his dub mixes worked tracks from some of the top musicians of the day such as Jackie Mittoo, Delroy Wilson, Johnny Clarke and Augustus Pablo. His dubs involved 'playing' the mixing desk live, adding FX and re-structuring the pre-existing 'riddims'. So the divide between Deejaying and producing music to DJ has been crossed for many years. They have fed off each other. Djs have discovered production techniques and producers have used DJ skills in their productions. From the 1960s there have been people who have had a hand in both and it continues to the present day. The disco DJs also started to produce, with arguably Francois Kervorkian being the most successful, but Larry Levan also ventured into the studio as did Frankie Knuckles. Other seminal moments include the Grandmaster D.ST scratch in Herbie Hancocks - Rockit, Afrika Bambaatta using German producers Kraftwerk synths to create Planet Rock, DJ Shadow bringing his record collection to the table as the most important element in his productions and on and on. But it is house music that must claim to be the beginning of the era of the DJ/Producer as we know it today. As sampling technology entered the fray and increasingly powerful synths and drum machines became affordable, in the mid 1980s, Djs were able to make tracks in home studios without the expense and fuss of the recording studio. DJ Pierre, defined by his very name as a DJ, created the first ever Acid House record Acid Tracks, using the Roland TB303 Bass Line generator. Now you didn't have to be Gamble & Huff to make a record or Larry Levan to play them. Marshall Jefferson started as a producer, who produced some of the best house music ever, who then went into Deejaying while Chicago Dj Lil Louis covered both fields with ease. "We just wanted to DJ. Our thing was about the music. Even to this day...we wanted to DJ at as many (parties) as we could." Yet they are both responsible for some of the most mind blowing and unforgettable moments in techno music ever created. By this stage in the late 80s you really could be a DJ/Producer, both relentlessly toured the world plying their craft as Djs, following their production success. Derrick May even gave up producing records, maybe he felt it was his time and place to produce or maybe he just loves Deejaying too much. Maybe one day I'll ask him.